Home Last month there was a very good article about winter forages for meat goats in the southeast by Frank and Bruce Pinkerton. The only problem I had with it was the very last section that discussed the comparative nutritional value of selected winter crops and the accompanying table. My problem is that the nutrition figures given were for the dry matter in the forage. The authors briefly acknowledged that on an as-fed basis the figures would be lower, but really didn't give the reader any idea of the magnitude of the difference, or the fact that forages that look great on a dry matter basis can be considerably less attractive on an as-fed basis. The math necessary to calculate the difference isn't that complicated, you just multiply the %dm times the %CP or %TDN depending on which you are interested in knowing on an as-fed basis. 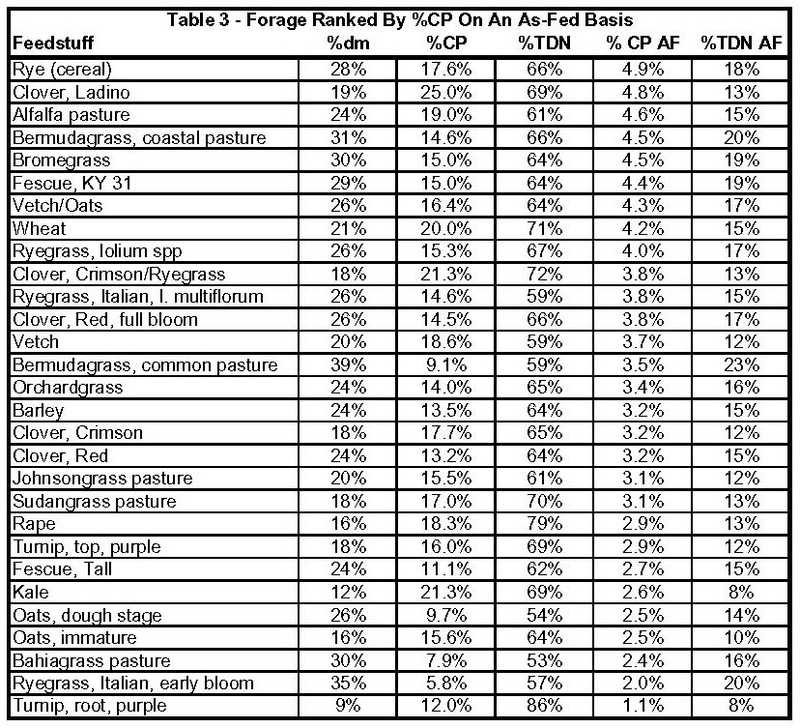 Therefore, a forage which has 25% CP and 25% dm is really providing only 6.25% (25% x 25% = 6.25%) CP on an as-fed basis. 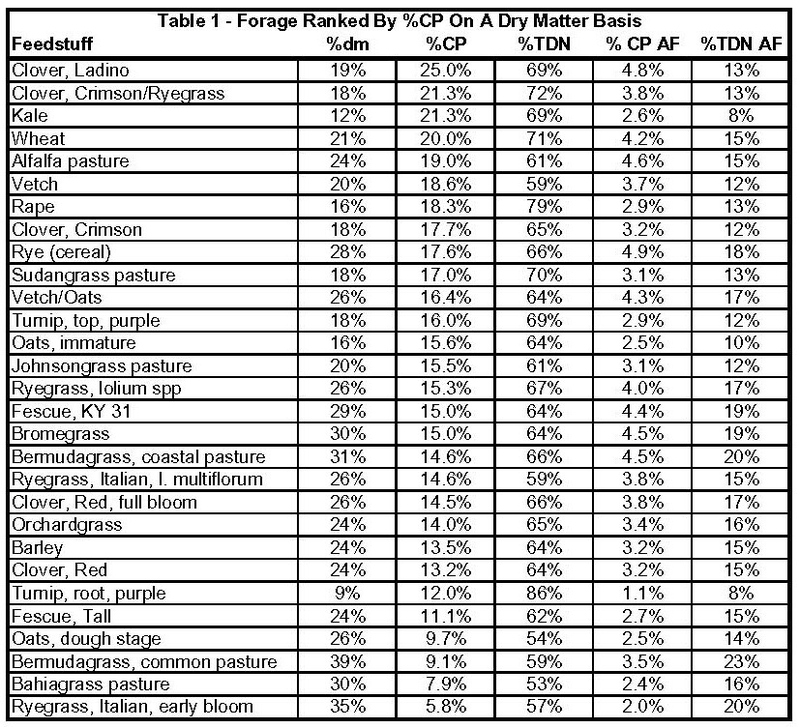 Table 1 ranks the various forages by their %CP on a dry matter basis. This information is valuable if you plan on growing hay, but if you are going to graze the crop instead, you will probably select the wrong forage or think your goats are feeding considerably better than they are. For instance, Kale ranks third in %CP on a dry matter basis at 21.3%. 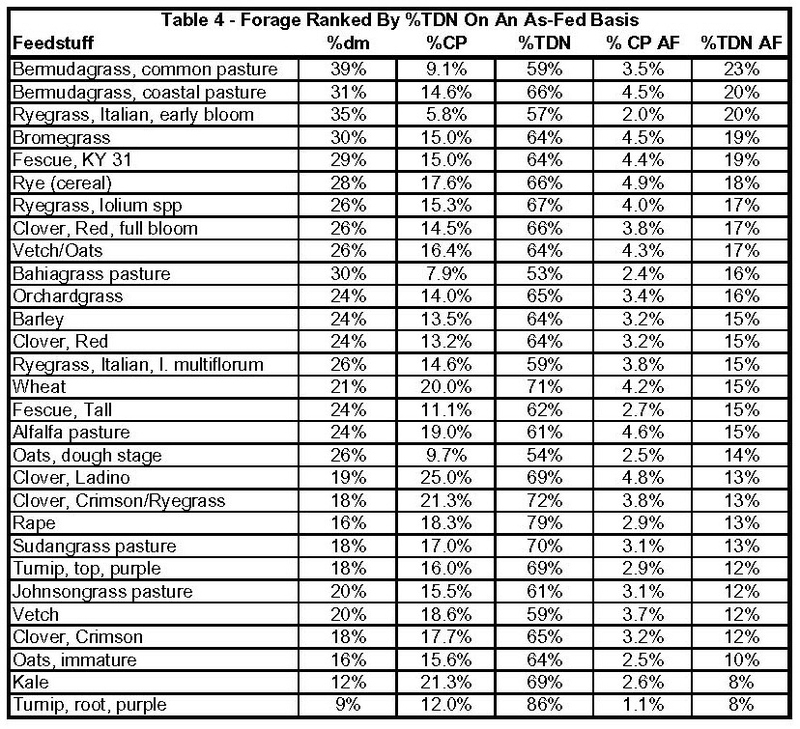 However, if you look at Table 3, which ranks forages by % CP on an as-fed basis, you will find Kale is one of the lower ranked forages because growing in the field it is mostly water (88% moisture content). Your does might just drown before they consume enough Kale to meet their nutritional requirements. Another interesting observation is that there is really very little difference between immature oats and dough stage oats on an as-fed basis. If you are cutting hay, immature oats are far superior, but as far as that goat grazing in the pasture is concerned the dough stage oats are actually slightly better. You will notice that clovers rank very high both on a dry matter basis, and on an as-fed basis. I have tried several varieties of clover over the years, and my experience is that it provides little or no forage until late spring, and then only if it wasn't grazed heavily over the winter. In general, I find that clover sprouts in the fall when cooler weather arrives, then just sits there until temperatures start to warm up in the spring. In the meantime, the goats will browse many of the plants to the ground, and few survive to spring when they really start to grow rapidly. If you have a pasture that you can keep the goats off until late spring, clover might work for you, but in my experience you will have some very hungry goats if you try to rely on it for fall/winter forage. Two of the best forages on an as-fed basis are Cereal Rye and Bromegrass. I was very happy to see that since a mixture of the two just happens to be what I use on my own pasture. Planted early enough they will produce good quality pasture from October through June in my area, provided it rains. The Cereal Rye generally provides good forage until about March, and the Bromegrass will keep the goats in groceries until June, by which time we have weaned our kid crop. The other two tables I provided rank forages on their %TDN. Table 2 ranks %TDN on a dry matter basis, and Table 4 ranks %TDN on an as-fed basis. Another, high moisture content feedstuff is of note here. 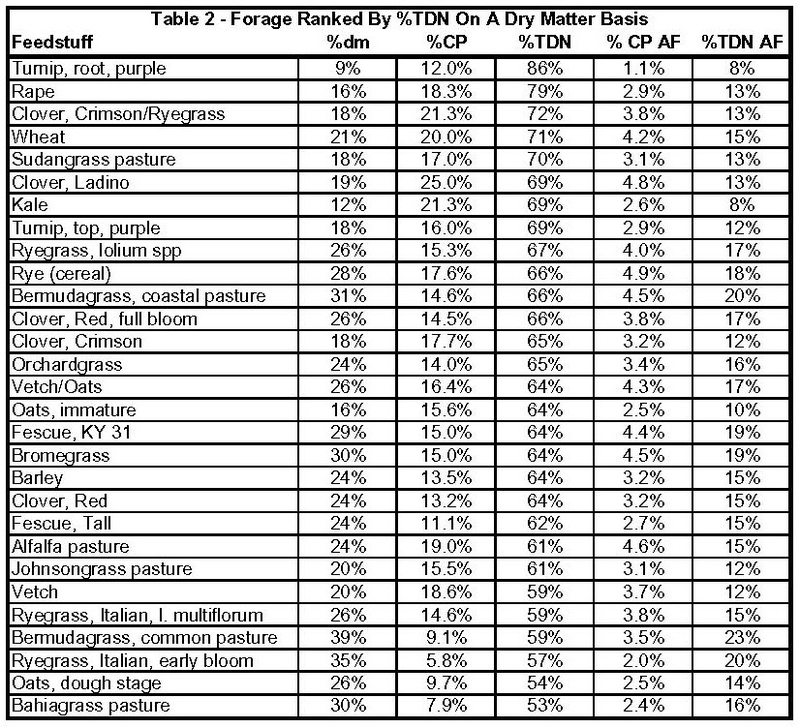 Purple Turnip roots are ranked first if you look only at the %TDN on a dry matter basis, but when you factor in their 91% moisture content they rank dead last on an as-fed basis. If a lactating doe requires 2.7 lbs per day of TDN, then she would have to consume a whopping 33.75 lbs per day of fresh Purple Turnip roots to meet that requirement. To meet her CP requirement of about .6 lbs per day would require an astonishing 54.55 lbs per day. The same doe only needs to consume 12.24 lbs per day of Cereal Rye to meet her CP requirement, and 15 lbs/day to consume enough TDN. I won't pretend to know how much forage a mature doe can consume in a day, but I've got to believe the figure is a lot closer to 15 lbs. than 55 lbs. If you are going to plant forage, don't ignore the moisture content when you are deciding what to plant, or you may find yourself wondering why your goats look like they are on a water diet when they are standing in a sea of green vegetation.